Sarah Nader - snader@shawmedia.com Marengo's Hunter Simonini looks at the scoreboard while he walks off the court after losing Tuesday's game against Burlington Central February 24, 2015. Marengo was defeated, 71-73. Sarah Nader - snader@shawmedia.com Burlington Central's Zach Schutta (left) jumps to block a shot from Marengo's Hunter Simonini during the fourth quarter of Tuesday's game at Burlington Central High School February 24, 2015. Marengo was defeated, 71-73. 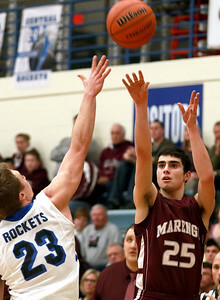 Sarah Nader - snader@shawmedia.com Marengo's Weston Shepard (left) shoots during the fourth quarter of Tuesday's game against Burlington Central February 24, 2015. 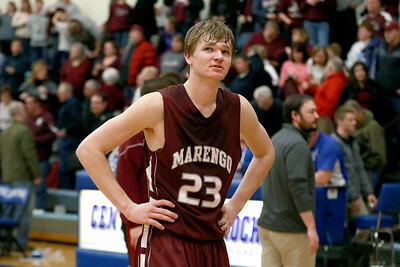 Marengo was defeated, 71-73. 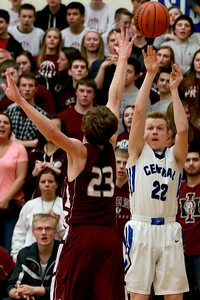 Sarah Nader - snader@shawmedia.com Marengo's Zach Knobloch shoots over Burlington Central's Drew Wiss during the third quarter of Tuesday's game at Burlington Central High School February 24, 2015. 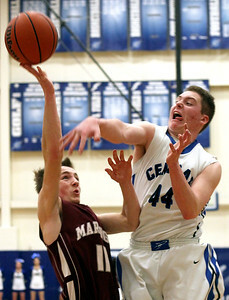 Marengo was defeated, 71-73. 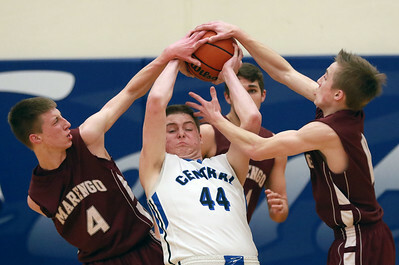 Sarah Nader - snader@shawmedia.com Marengo's Weston Shepard (left) and Michael Volkening try to take control of the ball from Burlington Central's Ryan Fitzgerald during the third quarter of Tuesday's game at Burlington Central High School February 24, 2015. Marengo was defeated, 71-73. Sarah Nader - snader@shawmedia.com Burlington Central's Stefan Jochum (left) has his shot blocked by Marengo's Greyson Smith during the third quarter of Tuesday's game at Burlington Central High School February 24, 2015. Marengo was defeated, 71-73. 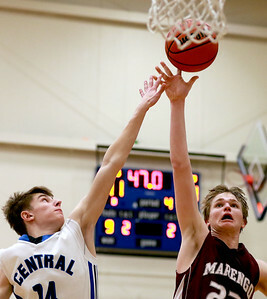 Sarah Nader - snader@shawmedia.com Marengo's Michael Volkening (left) has his shot blocked by Burlington Central's Ryan Fitzgerald during the third quarter of Tuesday's game at Burlington Central High School February 24, 2015. Marengo was defeated, 71-73. 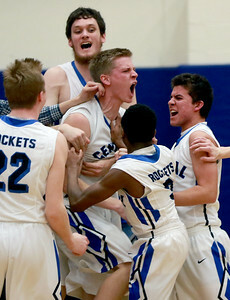 Sarah Nader - snader@shawmedia.com Burlington Central celebrates their win against Marengo after Tuesday's game against Marengo at Burlington Central High School February 24, 2015. Marengo was defeated, 71-73. Sarah Nader - snader@shawmedia.com Burlington Central's Joe Ratzek shoots over Marengo's Hunter Simonini during the first quarter of Tuesday's game at Burlington Central High School February 24, 2015. Marengo was defeated, 71-73. 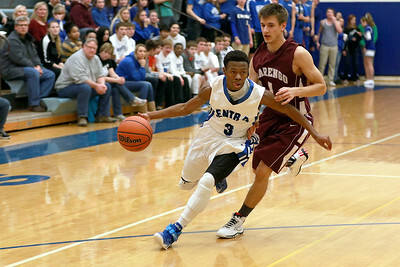 Sarah Nader - snader@shawmedia.com Burlington Central's Ta Vontae Harris brings the ball down court during the second quarter of Tuesday's game against Marengo at Burlington Central High School February 24, 2015. Marengo was defeated, 71-73. 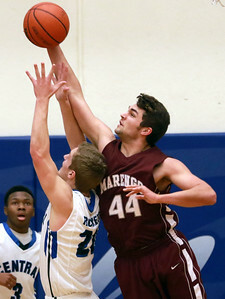 Marengo's Weston Shepard (left) and Michael Volkening try to take control of the ball from Burlington Central's Ryan Fitzgerald during the third quarter of Tuesday's game at Burlington Central High School February 24, 2015. 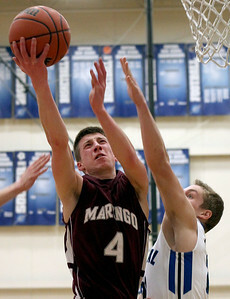 Marengo was defeated, 71-73.